"She just loves you, that's all. It won't last." Suburban ennui may hit a little too close to home for older patrons at the multiplex, and hence a movie like this one was never going to be a big, breakout hit. Instead, The Secret Lives of Dentists is a thoughtful, deeply felt work from some very talented people; much of it is too opaque, but there's plenty here to provoke thought and discussion. 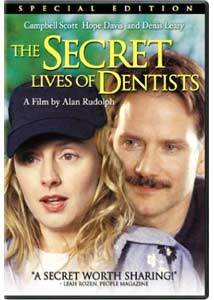 Campbell Scott and Hope Davis play the Doctors Hurst, a husband-and-wife dentist team; open wide and stay calm, and they'll look after you. They seem the very picture of suburban satisfaction: successful careers, lovely home that could be in the Pottery Barn catalog, three adorable little girls. But something ain't right between Dana and Dave; in a word, the thrill is gone. So yes, we're very much in Cheever country, but this movie doesn't have the clinical distance that you find in, say, The Ice Storm�instead, the central conceit of the movie is what gives it a certain amount of visual life. It's no surprise that the screenwriter on the project is the inventive Craig Lucas; a similar sort of central conceit can be found in his Prelude to a Kiss, and he's deft with these touches of magic realism in a world that seems otherwise mundane. The script is based on a novella by Jane Smiley, and I don't know if it's Smiley or Lucas, but sometimes these characters sound very overwritten, a writer's precious version of what they think people are feeling, not what they really say. (E.g. Dave, re Dana: "I wish that she would look at me with desire instead of regret.") But the director, Alan Rudolph, is very strong especially with behavior, and lots of this seems true to life. After a while, though, you realize that you don't know very much (nor care very much) about these people, and even the strong work from Davis and Scott can't open up the souls of these two. Why is she cheating on him? What does he think about it? Why did they get married in the first place, and why are they still together? Not that I want to see the story reduced to the level of soap opera, but at a point you may become hungry for information; and things get very Susan Sontag, with illness as metaphor, but at some point a house full of people throwing up with the flu is just a house full of people throwing up. I admire Rudolph for deliberately denying us the obligatory scenes, the confrontations; and Dave may be the most passive-aggressive protagonist in film history. And so you may empathize with his pain, or want to slap him around, but even if you care for the guy, at some point he becomes a little tiresome. Which is probably the point of the exercise; so the fabric of the film is strong, but we end up with no rooting interest for any of them to do anything. No doubt we'll all see aspects of our lives mirrored in these characters, because they're portrayed with particularity and care; but similarly, one of the principal reasons that people pop DVDs into their players is to escape from suburban minutiae, and not to wallow in it. Image Transfer Review: Cinematographer Florian Ballhaus's work contributes a tremendous amount to the storytelling�occasionally red filters make characters looks as if they're emerging from a psychological horror movie�but there are a few little transfer problems. Debris and scratches are evident with some frequency, and fleshtones are a little off; the actors tend to look a little too orange. Audio Transfer Review: Rudolph has a keen ear for music, but he seems to go to the well a few times too often, first with passages from Verdi's Nabucco, then with the base line from the Peggy Lee hit, Fever. The atmospherics on the 5.1 track are pretty well balanced, at least, though there are lots of scenes with nothing but talking in rooms, and hence lots of room tone. Extras Review: The director is joined by his leading man (who is also his producer) for a chatty commentary track; they're jolly and jovial and informative, but if Rudolph especially wasn't trying so hard to crack jokes the track would be even better. Still, it's full of interesting details about the production, and you've got to admire their inventiveness for making such a visually intriguing film, entirely without special effects, and on a limited budget. They're not apologetic about their affection for the project, and Rudolph even mentions this at one point, speculating about those of us listening to him: "I can see people at home responding, 'Well, at least these as***les liked the movie.'" The highlight of the package (04m:22s) of four deleted scenes is a clip featuring an intimacy between Dave and Dana that's deliberately absent from the final cut; and a blooper reel (03m:56s) is probably more fun for the cast and crew than the rest of us. Perhaps most informative is Anatomy of a Scene (27m:01s), produced originally for the Sundance Channel; it examines the sequence in which we see Dave first suspect that Dana is cheating on him. It features interviews with Rudolph, Scott, Davis, Lucas and Ballhaus, as well as the editor, producer, and production designer; after they've all talked about it, you can watch the scene in its entirety, with a new appreciation for their work. Is it safe? An odd little meditation on the silences that can overtake a relationship, The Secret Lives of Dentists will provide food for thought, but be sure to floss and brush afterwards.